Student Preachers and members of Students for Human Dignity and Diversity in Action attended Tulane University’s presentation of the 90-minute, one-person play, “Tolton: From Slave to Priest,” that immortalizes on stage the life of Father Augustus Tolton, a former slave who is the first recognized American diocesan priest of African descent. The Archdiocese of Chicago opened his cause for sainthood in 2011, giving him the title ,”Servant of God.” The St. Luke Production was sponsored by the Office of Black Catholic Ministries of the Archdiocese of New Orleans. It was held at Tulane’s McAlister Auditorium. Fr. Tolton (1854-1897), was born into a slave family of great faith. When he was nine-years-old, he fled with his mother and siblings through the northern Missouri woods and across the Mississippi River while they were being pursued by soldiers. The small family made their home in Quincy, Illinois, a sanctuary for runaway slaves. His father had died earlier in St. Louis, after escaping slavery to serve in the Union Army. Growing up in Quincy and serving at Mass, the young Augustus felt the call to the priesthood. However, because of rampant racism there was no seminary in America that would accept him. He went to Rome for six years of study. After his ordination, Fr. Tolton had a desire to serve as a missionary priest in Africa. However, his superiors wanted him to return in service as a missionary to his hometown community where he would again face racism. Ultimately, the choice was his and he chose to return home. His preaching drew many white Catholics who joined his black parishioners in the pews for his Masses. This upset white priests in the town. At the request of Archbishop Patrick Feehan, Fr. Tolton headed north to Chicago where he ministered to the black Catholic community. On July 9, 1897, he died of heatstroke while returning from a priests’ retreat. He was 43. The play is a production of St. Luke Productions (Battle Ground, WA). Leonardo Defilippis, president and founder, first learned of Fr. Tolton from a priest in the Diocese of Springfield, which includes the town of Quincy where Fr. Tolton served and is buried. Defilippis researched Tolton’s life. When deciding which play he would produce next, he noticed an artistic rendering of Fr. Tolton that he had hung in his office and started praying to Fr. Tolton. Defilippis said he felt the Holy Spirit was asking him to make a play of the priest’s life. The play premiered Nov. 5, 2017 at Chicago’s DuSable Museum of African American History. Good afternoon Dominican. Let us quiet ourselves and stand for prayer. 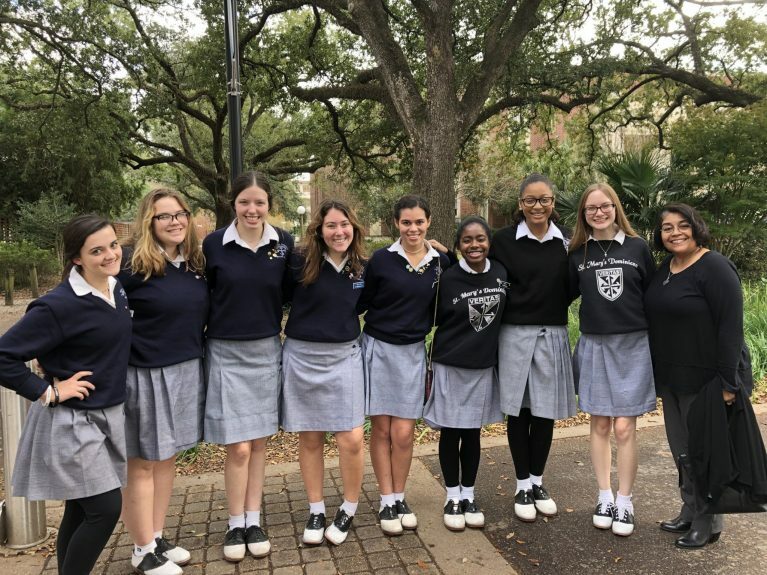 This afternoon a few Student Preachers and members of the Students for Human Dignity and Diversity in Action attended a play at Tulane about the first recognized American diocesan priest of African descent. We learned about the struggles that he went through to serve the Lord. He was a runaway slave who became a priest. He was denied admission to all of the seminaries in the country, causing him to go to Rome for his holy education. Because of racism, he was constantly insulted and threatened by many. He persevered through the help of God and became a priest and spread the word of the Lord to all people. This showed me that my problems are so insignificant and I need to have a more positive attitude. It also showed me that no matter the issue, the Lord will help you get through it. He is always there for you, wants us to succeed and spread His word. Let us all be more like Fr. Augustus Tolton and never give up. Let us pray a prayer for the sainthood of Fr. Tolton. Father in Heaven, Father Tolton’s suffering service sheds light upon our sorrows. We see them through the prism of Your Son’s passion and death. If it be Your will, O God, glorify Your servant, Father Tolton, by granting the favor I now request through his intercession so that all may know the goodness of this priest whose memory looms large in the Church that he loved.